Nadir altimeter Sea Surface Height (SSH) measurements have made major contributions to the understanding of the ocean circulation. While along-track SSH data can observe wavelengths as small as 50-70 km (with a measurement noise of about 2 cm rms at 7 km) (see Dufau et al., 2017 for a recent analysis), global mesoscale resolution is strongly limited by the space and time sampling of a given altimeter mission. The use of multiple altimeters is needed to provide global maps of mesoscale variability. Various studies have been carried out to quantify the capability of existing constellations (e.g. Le Traon and Dibarboure, 1999; Chelton and Schlax, 2003; Pascual et al, 2006; Dibarboure et al., 2012); they showed that at least three altimeters are required to reconstruct the global ocean surface topography at mesoscale resolution. Yet the merging of multiple altimeter missions cannot resolve wavelengths smaller than 150 – 200 km (e.g. Ducet et al., 2000, Le Traon et al., 2001). SWOT will extend the capability of existing nadir altimeters to two-dimensional mapping at much higher resolution. This will allow observing mesoscale and submesoscale signals for wavelengths between 20 and 200 km. The surface topography measurement will be based on both a nadir altimeter and a Ka-band Radar Interferometer (KaRIN). With a 130km wide swath, the spatial coverage will be nearly global every 22 days. SWOT should measure ocean surface topography with a precision of few centimeters over areas of less than 1 km2. Mesoscale and submesoscale features have amplitudes that are decreasing with wavenumber and the signal variance for wavelengths below 100 km is typically of a few cm2. SWOT's capability to observe mesoscale and sub-mesoscale signals will thus strongly depend on the level of measurement errors and our ability to merge SWOT data with conventional altimeter data to fill gaps in between swaths (e.g. Pujol et al., 2012). The main objective of our project is to prepare the assimilation of SWOT in Mercator Ocean and Copernicus Marine Environment Monitoring Service (CMEMS) high resolution ocean models. Assimilation of SWOT data together with conventional altimeter missions into ocean analysis and forecasting models is an essential and (most likely) mandatory step to develop a wide use of SWOT data for ocean applications. This is also required to better address many mesoscale/submesoscale research issues. SWOT will provide very high and unique resolution observations along its swaths (effective wavelength resolution of 15 km as stated in the mission science requirement document) but will not be able to observe high frequency signals (periods < 20 days). In addition at large scales (> 1000 km), SWOT data will have to be adjusted and merged with conventional altimeter data. A major challenge will thus be to combine SWOT data with conventional along- track altimeters together and in-situ observations (e.g. Argo) with very high resolution models (resolution of a few km) to allow a dynamical interpolation of SWOT data and a description and forecast of the ocean state at high resolution. SWOT measurement noise will also be quite complex and will include different sources of correlated errors (e.g. roll error) that must be properly taken into account in a data assimilation scheme (e.g. Le Henaff et al., 2008) to ensure an effective use of SWOT data. Analysis of the processing steps required before the assimilation of SWOT data into ocean models. 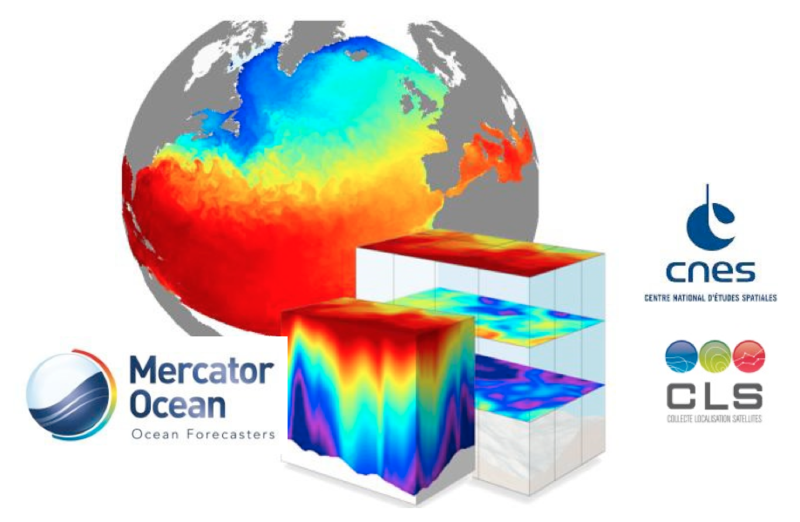 Mercator Ocean (and CMEMS) is interfaced with SSALTO/DUACS which is providing directly useable and intercalibrated level 3 data to be assimilated in Mercator Ocean models. We will define the SWOT data pre-processing required at the level of multi-mission SSALTO/DUACS system and work on the interfaces between Mercator Ocean and SSALTO/DUACS. It is likely that most of the processing algorithms required to correct for SWOT large scale errors (e.g. roll errors) and intercalibrate SWOT with conventional nadir altimeter missions will be applied before data are assimilated into ocean models. Most likely full resolution data (1 km) will not be used directly in ocean models and super observations at lower resolution will be used. All these aspects need, however, to be carefully analyzed and tested. We will also address operational aspects and based on sensitivity studies (see below), we will provide requirements to the SWOT project team for the development of a near real time processing of SWOT ocean data. Development and test of data assimilation schemes. Our past studies have shown that improved data assimilation schemes are required to make the best use of SWOT data (e.g. better handling of high frequency barotropic signals, better control of vertical structure of submesoscale, mesoscale and large scale signals, control of vertical velocity, adaptability of the errors, use of ensemble methods). We will progressively (in cooperation with other teams) increase the complexity of our data assimilation schemes to develop an effective use of SWOT data into ocean models. Our approach will be based on the development and use of Observing System Simulation Experiments (OSSEs) in high resolution models with and without tidal forcing. This will allow us both to test new data assimilation techniques but also to assess the contribution of SWOT data for ocean analysis and forecasting. OSSEs typically use two different models. One model is used to perform a “truth” run - and it is treated as if it is the real ocean. The truth run is sampled in a manner that mimics either an existing or future observing system - yielding synthetic observations. The synthetic observations are assimilated into the second model, and the model performance is evaluated by comparing it against the truth run. Mercator Ocean has performed first OSSEs of SWOT observations using a 1/12° regional model of the Iberian Biscay region that includes tidal forcing and internal tides. The truth run was derived from a 1/36° model run over the same region (Benkiran et al., 2017). This study demonstrated the feasibility of assimilation of SWOT data in the Mercator Ocean high resolution models. 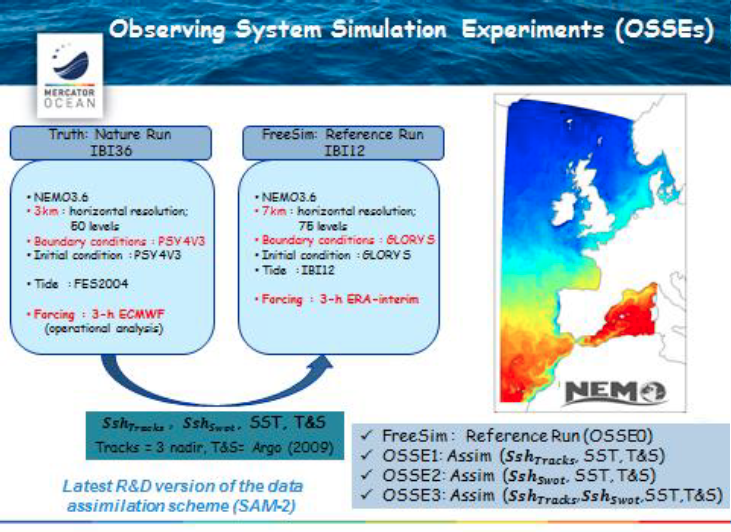 It also demonstrated the high potential impact of SWOT observations to constrain ocean analysis and forecasting systems (see figure 1 below). The study did not take into account, however, the full error spectrum of SWOT and also revealed that further improvement of the use of SWOT could be obtained with improved data assimilation schemes. Figure 1. Initial OSSEs performed as part of the DESMOS project. 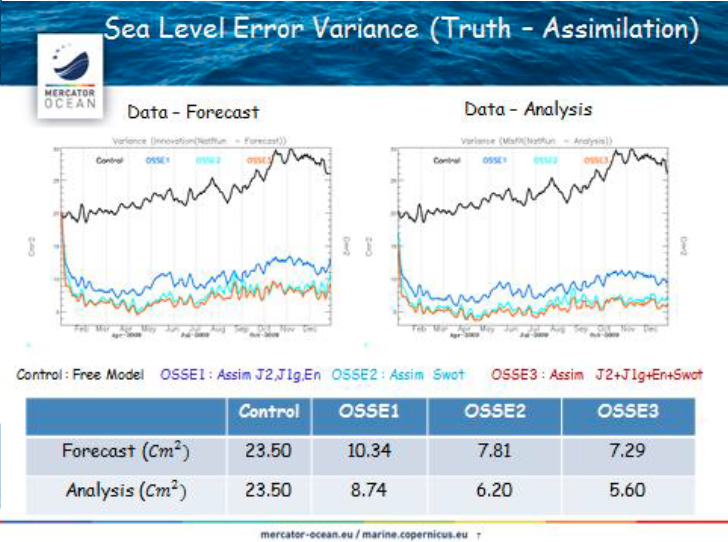 In these OSSEs that only include Karin noise, compared to 3 nadir altimeters (=present situation), SWOT with 3 nadir altimeters (=post 2021 situation) allow a reduction of 5 -day sea level forecast errors by about 30% and a reduction of sea level analysis errors by about 45%. Our plan is to extend our previous OSSEs to the 1/36° Iberian Biscay model. The data assimilation system (so called SAM2) (e.g. Lellouche et al., 2013) will continue to be improved to better use SWOT observations. Many parameters need to be tested and tuned to the assimilation of SWOT. We plan, in addition, to address the following points: correction of large scale errors, adaptability of errors, multiscale issues, better control of the vertical structure, handling of barotropic and internal tides in the data assimilation system. We will also take into account the full error spectrum of SWOT making use of SWOT ocean simulators. Extensive analysis of results will then be carried out to quantify the ability of the model to act as a dynamical interpolator. We will also quantify improvements due to the assimilation of SWOT data both for analyses and forecasts (predictability issues). These analyses will not be limited to SSH fields but will cover the full ocean state (horizontal and vertical velocities, vertical structure, integrated quantities such as heat fluxes and transports). Use of SWOT data in Mercator Ocean and CMEMS systems will require a capability for near real time processing of SWOT data (< 1-2 days). We plan to provide guidance to the project for the definition of required products and data latency requirements. There is also a need to ensure (upstream) consistency with other altimeter missions (Sentinel-3, Jason-CS/Sentinel-6) including large scale error reduction and cross calibration methods to be applied in near real time (e. g. Dibarboure and Ubelmann, 2014). We will define the SWOT data pre-processing required at the level of SSALTO/DUACS system and work on the interfaces between Mercator Ocean and SSALTO/DUACS. SSALTO/DUACS teams are also working on the development of new high resolution mapping techniques to combine SWOT data with conventional altimeter data. OSSEs will be used to assess the capabilities of these techniques and results will be compared with those derived from modelling and data assimilation techniques. We will continue working on data assimilation methods. Mercator Ocean plans, in particular, to move to ensemble methods (e.g. ensemble Kalman filter) and we expect to start testing these advanced methods for the assimilation of SWOT in regional models. We will prepare the assimilation of SWOT data in the global 1/12° model by performing several OSSE with a regional configuration covering the North Atlantic, the Mediterranean sea and the Arctic ocean at 1/12° resolution (CREG). The objective will be, in particular, to quantify the impact of SWOT data assimilation in areas of high variability such as the Gulf Stream area. OSSEs with the CREG configuration will use as a truth run the very high resolution (about 1/60°) NEMO-NATL60 simulation from LGGE. We also plan to test empirical algorithms for the correction of internal tides in Mercator Ocean models. SSALTO/DUACS system will be developed to include SWOT data. Assimilation SWOT data into global high resolution ocean models is a major scientific and operational challenge. The assimilation of SWOT data together with other satellite and in-situ observations in high resolution ocean models will be highly valuable for many science investigations. A successful « integration » of SWOT data in Mercator Ocean and CMEMS global and regional modelling and data assimilation systems will also allow demonstrating its usefulness and impact for a wide range of ocean applications. Applications that will most benefit from SWOT observations are related to the very high resolution observations that SWOT will provide. The assimilation of SWOT data in ocean models will instrumental to control smaller scales (< 100 km) that are not well constrained by conventional altimeters. Most impacted fields will be surface and intermediate horizontal velocities. This will directly impact key applications such as marine safety, pollution monitoring, ship routing, offshore industry. A better constraint of vertical velocities will also directly impact biogeochemical applications. Benkiran M., E. Remy, E. Greiner, Y. Drillet and P.Y. Le Traon, 2017. An Observing System Simulation Experiment to evaluate the impact of SWOT in a regional data assimilation system (in revision). Chelton, D. B., and M. G. Schlax, 2003. The accuracies of smoothed sea surface height fields constructed from tandem altimeter datasets. J. Atmos. Oceanic Technol., 20, 1276-1302. Dibarboure G. M.-I. Pujol , F. Briol , P. Y. Le Traon , G. Larnicol , N. Picot , F. Mertz , M. Ablain, 2014. Jason-2 in DUACS: Updated System Description, First Tandem Results and Impact on Processing and Products. Marine Geodesy, Vol. 34, Iss. 3-4, 2011. Dibarboure, G., Labroue. L., Ablain. M., Fjørtoft, R., Mallet, A., Lambin. J., Souyris. J.C., 2012. Empirical cross-calibration of coherent SWOT errors using external references and the altimetry constellation. Transactions on Geoscience and Remote Sensing, Vol. 50, Iss. 6, 2325 - 2344. Dibarboure, G.; Ubelmann, C., 2014. Investigating the Performance of Four Empirical Cross- Calibration Methods for the Proposed SWOT Mission. Remote Sens., 6, 4831-4869. Ducet N., P.Y. Le Traon, G. Reverdin, 2000: Global high-resolution mapping of ocean circulation from the combination of T/P and ERS-1/2. J. Geophys. Res., 105, 19,477-19,498. Dufau, C., M. Orsztynowicz, G. Dibarboure, R. Morrow, and P.-Y. Le Traon, 2016. Mesoscale resolution capability of altimetry: Present and future, J. Geophys. Res. Oceans, 121, 4910–4927, doi:10.1002/2015JC010904. Le Hénaff, M., P. De Mey, B. Mourre and P.Y. Le Traon, 2008. Contribution of a wide-swath altimeter in a shelf seas assimilation system - Impact of the satellite rolls errors. J. Atm. Oc. Technology, 25(11), 2133-2144. Lellouche, J.-M., Le Galloudec, O., Drévillon, M., Régnier, C., Greiner, E., Garric, G., Ferry, N., Desportes, C., Testut, C.-E., Bricaud, C., Bourdallé-Badie, R., Tranchant, B., Benkiran, M., Drillet, Y., Daudin, A., and De Nicola, C., 2013. Evaluation of global monitoring and forecasting systems at Mercator Ocean, Ocean Sci., 9, 57-81. Le Traon, P.Y., G. Dibarboure, and N. Ducet, 2001. Use of a High-Resolution Model to Analyze the Mapping Capabilities of Multiple-Altimeter Missions. J. Atmos. Oceanic Technol., 18, 1277-1288. Le Traon, P.Y. and G. Dibarboure, 2002. Velocity mapping capabilities of present and future altimeter missions: the role of high frequency signals. J. Atmos. Oceanic Technol.,19, 2077-2088. Le Traon P.Y. 2013. From satellite altimetry to Argo and operational oceanography: three revolutions in oceanography. Ocean Science, 9(5), 901-915. Pujol M.I., G. Dibarboure, P.-Y. Le Traon and P. Klein, 2012. Using High-Resolution Altimetry to Observe Mesoscale Signals. J. Atmos. Oceanic Technol., 29(9), 1409-1416.